Several years after I finished my degree in physiology, I returned to the University of Melbourne for a year of Fine Arts, or visual art history. I was working by then, writing about arty things and reviewing theatre and forcing down some champagne at opening night parties, so I was always a little exhausted by the end of the day – not as exhausted as say, Lindsay Lohan at the end of an average evening, but a bit fatigued. So after a long day of fending off publicists and opening mail I’d go to the lecture hall and the lights would go down and the discussion of Picasso or Manet or Vlaminck would begin. And I would try not to fall asleep even though the subject matter was so interesting I didn’t want to miss a word. I guess it depends how you define joy, but an artist explaining his or her work is pretty exciting for me. On Sunday evening I met Chinese artist Fu Xinmin, whose ink paintings are part of the exhibition Controversial Two in One at Galeri Seni Mutiara in George Town. From Amoy, Fukien province, Fu doesn’t speak a word of English, but luckily my friend Ang Huah was nearby to translate. Having made some notes and taken some photos I was moseying over to where the wine was when Fu hunted me down to discuss one of his works that I had just photographed. Fu Xin and his ink painting Metamorphosis A8. Sinking or floating? This one is called is called Metamorphosis A8, and first of all Fu wanted to know if the spherical shapes were sinking or floating. They could be either, but there was a suggestion of effervescence at the top, so I would probably go with floating. Fu is passionate about his art. He waved away a plate of Chinese delicacies at this point to continue talking, and we moved on to discuss to another work. Moonlight is a about Fu’s search for peace; it emphasises the silence of the night in the midst of our hectic lives in this modern, frenetic society. Fu said he has six styles of painting, and his work explores the realm where his inspiration intersects with his quest for serenity. 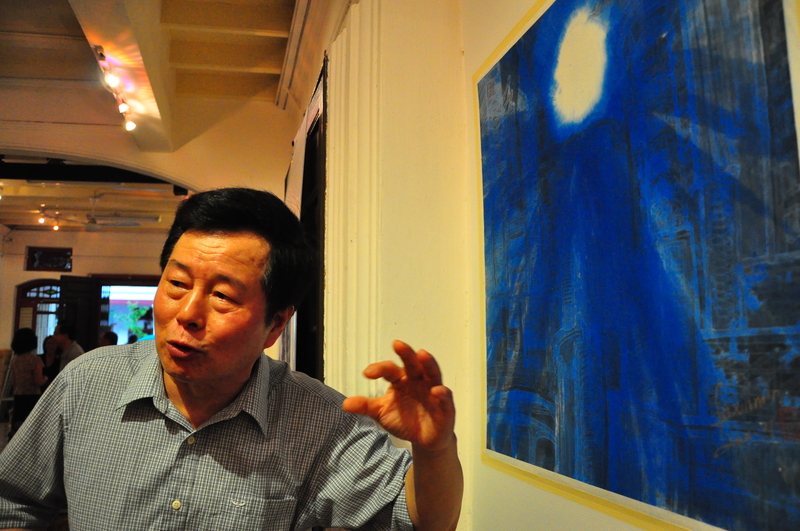 An artist and sculptor for more than 40years, Fu has been honoured as a guest professor at a number of Chinese universities and has written a number of books. 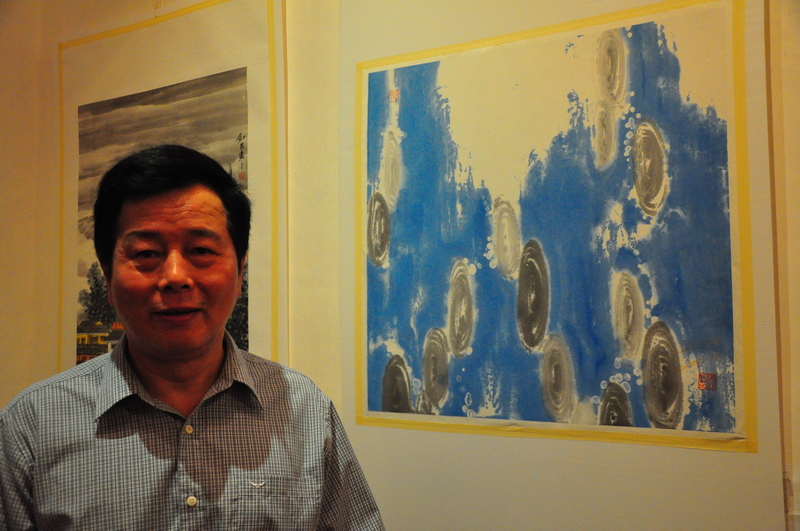 Shen Zhaochang is the other prize-winning artist featured in this exhibition, and his style combines the traditions of north Chinese painting with techniques from south China. His work is a vehicle ti display his love of nature and landscapes. The exhibition continues until May 31, 2012. Happy to read your new web page.. i will send N translate into simple Mandarin text to Mr.Fu, good luck to your work..keep on with ur good job..Happy wishes.